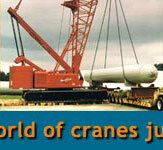 eCranes is designed to provide the ideal match between the crane sellers and buyers. This portal allows sellers to advertise their cranes on our site, providing worldwide access to crane users and traders alike. With eCranes, you will speed up disposal of your cranes at your ideal price. Buyers have a wider range of selection, crawler cranes, mobile cranes, tower cranes, harbor cranes, any type of cranes, and of any make, age and price of your choice. There is no better match than this! Click on Type or Specifications to view the full range of cranes online or click on Post Crane to Post your cranes now! Do also visit our Cranes for Sale for current special deals. Parts sourcing is made easy with Parts Search, a one stop call to the data base that concentrates on Heavy equipment Spare Parts for Hitachi, Sumitomo, Link-Belt, Kobelco, P&H, American, Grove, Manitowoc, Kato, Tadano, Kawasaki, Mitsubishi, TCM, Bomag, Sakai, Terex, Euclid, Komatsu, Caterpillar, Cummins, Baldwin, Pulton, Tsubaki and many other popular brand names. Click on Parts Search and see how easy it is to access price and availability from this unqiue portal available to all members of the World of Cranes. LOGIN NOW! To experience the Power of Conveniences. General Information may be used for reference purpose only.